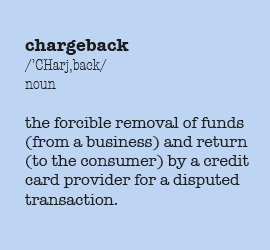 A recent meeting with a business partner spurred an interesting conversation about chargebacks. While chargebacks are a pretty common topic in our line of work, this time it touched on a notion that I hadn’t really considered before – how the risk of chargebacks can actually protect a business. In my mind, chargebacks are the bane of a business’s existence, but a necessary evil to protect the rights of the consumer. Is it always fair to forcibly remove funds and return them to the consumer every time? Probably not. Do I want that type of swift and immediate protection when I see an unauthorized charge on my credit card? You bet. Banks and credit card processors will always return funds to the consumer, and will typically affect a chargeback fee to the business. The business is then left to sort out the details of the dispute. With the headache that ensues, you might ask how on earth chargebacks protect a business? There are the common ways that chargeback prevention forces a business to be extra clear on payment terms for goods or services rendered, not to mention maintaining a good client relationship. This extra care will prevent the instances of chargebacks that occur out of sheer misunderstanding. But there are other categories of chargebacks, such as those triggered by fraudulent activity. These are the cases where fraudsters take advantage of the swift and immediate protection delivered by the credit card issuer, reaping the goods or services AND a full refund in the process. And, these fraudsters know to prey on small businesses, since they tend to be more likely to negotiate billing terms. The fraudster will offer up a large purchase and a lump sum payment on delivery. Meanwhile, they are waiting for you to ship the goods so they can disappear with their refund and your product. The prevention? Charge for goods at the time of purchase, not on receipt or delivery, however attractive the deal may be. There is another type of chargeback that occurs in good faith, but still exposes you to greater risk. I’ll call it the “lump sum” chargeback, for lack of a better term. This type of chargeback occurs when you’ve billed one lump sum for goods or services that could have been broken out into smaller items or service units. Say, for example, you own a gym and want to offer an annual membership at a discounted cost. Sounds great for both you and the member, right? Not quite. You may get your annual membership fee up front, but the patron can at any point decide to cancel and demand a refund. You might refuse (after all, you’ve delivered six good months of service and he signed a contract), but the patron can initiate a chargeback all the same. At that point, when the bank returns funds to the consumer, it’s essentially floating a loan with the assumption it will be able to recoup those funds from you, the business. Now you’re looking at losing not just next month’s membership fees, but funds you would have been able to keep from the six months prior. The solution? Even though it’s tempting, don’t bill for services more than 30 days at a time. Consumers are finicky creatures and the best of New Year’s resolutions in January could be your worst nightmare in July. Keep the common, the fraudulent, and even the “lump sum” chargebacks in mind with your billing policies – they can help protect you from financial loss.